I was wondering if any of you with some experience with hiza guruma and his renraku could give me some advice. This waza is one of the first I use to teach to children and white belts because, to me, it's one of the most effective, easier, safest and.. coolest throw to try. I noticed that, as the judoka grows in experience, hiza guruma starts to be less and less effective and difficult to finalize but still good to get some kuzushi... so I'm trying to link it with other waza for renraku/renzoku combinations. My question is: which renraku of hiza guruma are the most common and effective for you? Currently I'm trying hiza guruma -> osoto gari / o soto guruma (same leg) but i'm still not happy with the results. if you need I could provide a video. Sensei Yoko Tanabe (3xOlympic Medalist, Japanese/ World Champion) teaches how to used Hiza Guruma in combination with other throws like Osoto Gari and Taitoshi during a clinic at Tokhon Judo Academy of Chicago. For me Reverse Hizaguruma -> Osotogari. You can do it in situation Uke has leg in rear or front. I learn Hizaguruma to rear leg only - it could you see it more modern explanations. Tanabe sensei in video above teaches one very nice situation (Ukes foots are at the same position). She makes cross steps and creates situation where Uke has leg rear. 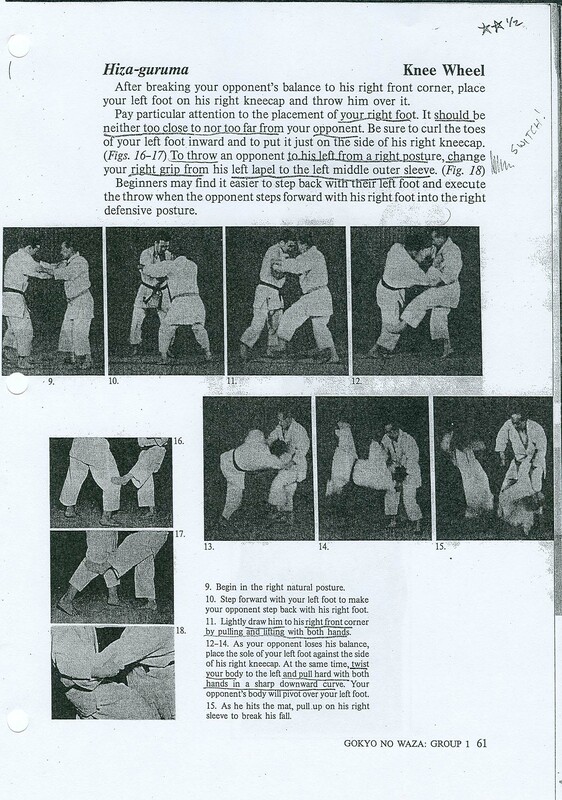 I saw the Hizaguruma doing to Ukes front leg in some older judo japanese books. May be it is ancient form of Hizaguruma. Tori weaks Ukes knee from back rear by his foot(thumb/big too - hooking?). Very interesting for me. I found some photos wth Mifune Kyuzos demonstration of Hizaguruma. Look at the picture 16 - there is it litlle bit displayed. Official video from Kodokan shows the same (both variations - to rear and front leg ). Hooking/weaking Ukes knee by foot is little bit showed in front leg version. Your opinions and notes are welcomed. Thanks for your reply noboru. 2) These renraku have hiza guruma as their conclusion (tai otoshi/osotogari --> hiza guruma), I was looking for renraku that starts from it. 3) Since my study is intended for yellow/orange belts, I wouldn't suggest them any attack who change the side of the throw without changing the grip (more in general: I wouldn't suggest them to attack the side of the lapel grip) for security reason. 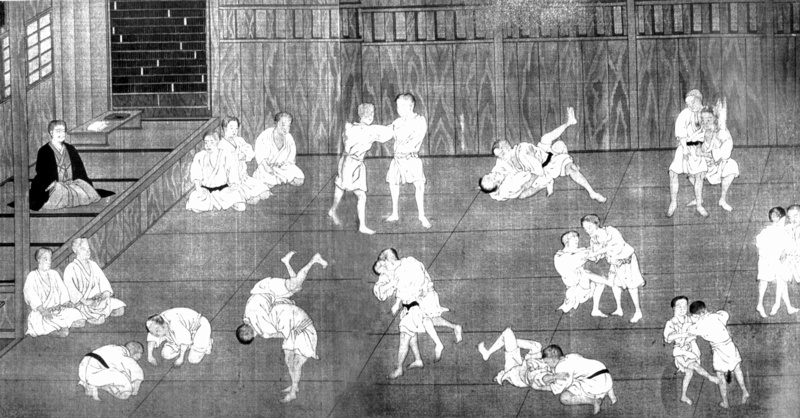 4) More in general I don't like the "KATA-RANDORI // SHIAI" theoretichal approach during teaching (of course you can teach reverse grip waza to intermediate and advanced judoka.. what sounds to me is to emphasize the theorethical distinction between kata and shiai during the teaching of a waza). I know this could sound a bit pretentious it's a difficult point to express for me, but maybe to understand me better consider that it's also perfectly possible to use the "kata" approach (just to use her definition) to hiza guruma during a shiai..
5) Probably i didn't get all the points of her teaching.. But I found this video, didactly speaking, quite poor. Just watched a medalist repeats again and again his hiza guruma after a brief and general introduction and some highlights of the tsukuri part but only in relation to footwork / distance. What do you mean with "reverse hiza guruma"? Without going off-topic, if you got any book-article to suggest me about it, please let me know it!! To the best of my knowledge both version of the waza are correct but the front leg version is the purest form of it since it depends more (for its effectiveness) from a nearly perfect kuzushi/tsukuri/debana application. There should be NO hooking at all in hiza and, to me, this varations are not hiza guruma at all (but variations of ko soto gake) and should not be practised as hiza guruma. I think Hiza Guruma is one of the best throw to start learning Judo since it simply doesn't work with a brute force approach but differently from de ashi barai, it's easier to apply in randori when one is novice. Look at the video with Yoko Tanabe (time 1:16). She does Hizaguruma from reverse grip. Personally I prefer to teach Hiza Guruma attacking the rear leg. It is a matter of leverage across the weak line of uke. Uke with legs apart can brace most effectively against force that is aligned with the line between his feet. The greater the angle of attack differs form that line, up to 90°, the more efficient the attack, as there is no means to resist. With the leg back, hiza-guruma attacks a line very nearly at 90° to the line between uke's feet. You'll notice in the Kodokan video that when attacking the forward foot Toris is basically pulling Uke over his braced right foot so that tori needs to exert more force and the throw seems to "stall" as tori builds up eough force to overcome uke's resistance. I think part of you trouble is that regardless of the grip taken, tori needs to adopt an extreme oblique angle to uke and fully extend his leg. You'll notice in Tanabe sensei's video how she emphasizes the importance of sufficient distance and space. Having adopted this position it does not leave tori in a good position for a follow-up in continuous attack. This is why you tend to see Hiza more as a follow-on attack than as a primary attack. If you're teaching relative beginners, I would re-orient towards Sasae tsuri-komi-ashi which leaves tori much closer, and in better position for follow-ups. Again a word of caution if you are nervous about the idea of reversed grips or "wrong side attacks. Most of the combinations involving sasae use a left handed sasae attack from a right-handed grip, which is then followed up by a right handed throw (ie. seoie nage) after uke reacts by jumping over or stepping around tori's attacking foot. I think you're right in the description of the dynamic of the throw. But I also think that, with proper tsukuri and debana, the front leg version is very efficient. Anyway the problem for the renraku with osoto is clearly the distance, as you pointed out. I will try again with your advices and add some feedbacks. Today morning I looked to famous book Kodokan Judo: Throwing Techniques by Toshiro Daigo. In the chapter related to Hiza Guruma is part Soni ni, where is described more details about version to front leg. At this moment, tori supports his body on the right leg puts the sole of his left foot on the outside of Ukes right knee (pressing the top of the back of the knee down in a sliding motion), and supporting it, he lifts up with the right hand and pulls diagonally down with the left hand. He positions Ukes body in the right front corner. Ukes right knee will ned slightly and he will be twisted to the right front corner, as his balance breaks (photo 27,28). It si extremely important for Toris right leg to be stable when it supports his body weight. If his right leg is positioned too close when he puts the sole of his left foot on Ukes right knee, his waist and left leg will not reach its target. Therefore, it is important that he judges the position of Ukes right leg as he steps, and steps his own right leg back to the most suitable position (photo 29). The unique feature of this technigue is that Tori places his foot on the side of Ukes right bent knee, and also pushes up and twist uke to teh side to thrown him." I'm would like to attach two fotos of pages with this explanation in this book, but is not available (any JSON errors). Here are, I found any free service for sharing fotos. This one is nice as it takes advantage of Tori's position following the hiza guruma attack. The downside for training with beginners is it requires uke to both dodge the attack and continue his forward motion by taking a step. Beginners are notoriously bad at "following the script" as uke and tend to freeze in place after the initial attack, which makes this type of follow-on difficult to train. The other one you could try is Hiza guruma to O uchi gari. Uke steps around the attacking foot. Tori takes advantage of uke's new open position to attack O uchi gari with their right leg attacking uke's left leg. I can't find a video, but I think it would work. Will have to try it out in the dojo and report back.